BenQ X12000 review | What Hi-Fi? A £9000 projector should be an exciting prospect. It is reaching towards ‘money no object’ territory, after all. For this amount of money, you’d expect a projector to be the perfect centrepiece of your home cinema system. Ideally it should be 4K and HDR capable, and ready to dazzle at any opportunity. And, of course, it should make you feel like you’re using a premium piece of kit. That’s what makes BenQ’s X12000 projector so baffling. Of those three qualities, it can only pride itself on having a 4K resolution – and even then, the route the company has taken to achieve this is complex. The moment you get the X12000 out of the box you’re met by a shining square badge on its top panel, proudly announcing this projector is capable of 4K Ultra HD. Most 4K projectors will have a native 4K chip, but the BenQ processing results in a resolution of 2716 x 1528. 4.15 million pixels – or half that of Ultra HD. The X12000 manages a 4K-resolution output using high-speed mirrors which reflect the projector’s image onto the screen – rapidly switching between two 4.15 million-pixel frames at 9000 times per second. While this might make for smaller chips and lower manufacturing costs, it’s still a little thwarting that BenQ has opted for this complicated method over a native 4K chip. 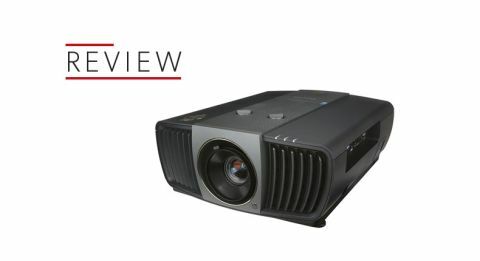 Other manufacturers have included 4K chips in projectors with lower price tags than the X12000, so the reason for the exclusion here isn’t immediately obvious. For all its complex technology, it’s a shame the X12000 hasn’t had its 4K delivery system paired with High Dynamic Range (HDR) technology to provide the widest possible colour range. After all, HDR is now available on many video streams and most 4K Blu-ray discs. While other high-end projectors can support the increased colour spectrum, the X12000 can only serve up an SDR signal. The X12000 does have a trick up its sleeve, though: it can artificially boost its colour range from SDR to DCI-P3. That's larger than standard dynamic range, and BenQ says this projector can rival those you find in your local cinema. But it’s still not as wide a range as HDR, so you won’t be getting the last word in colour reproduction. The contrast ratio clocks in at a claimed 50,000:1 from its 2200-lumen lamp. Like The Smiths’ song, it’s a light that will never go out. Okay, that’s a bit of an exaggeration - but with a lifespan of 20,000 hours it should be a good few years before you need to think about replacing it. For those looking slightly less far into the future, the X12000 will also support a 60fps frame rate. Avid gamers will be happy to learn that this projector can keep up with the speed of rapid first-person shooters. On a side-panel of the projector are the usual inputs: two HDMI ports (although only one has HDCP 2.2 support for 4K content), a connection for your PC, plus RS232 and ethernet port so you can pair it up with a home control system. Setting up the X12000 is easy - at around 18kg, this projector is lighter than you might think. It’s not small, measuring around 50cm lin length, so you’ll need a stand wide enough to support it (unless you’re planning to attach it to the ceiling). If you’ve got it ceiling-mounted, though, it’s not as easy to make adjustments as it could be. The X12000 has a manual focus and zoom, rather than automatic, which means you can’t get it picture-perfect from the comfort of your sofa. The remote isn’t particularly convenient either. The backlight only comes on once you press a button, which isn’t as handy as remotes that respond to movement, or even those with a dedicated backlight button. European models of the X12000 don’t have 3D support, and as such the corresponding button on the remote has no function – it’s a similar story for the 'Invert' button. For a premium product, you’d expect every design element to have a reason behind it, and having some buttons without a purpose in rather surprising on a product of this price. While setting up the projector, we disable some of the X12000’s extra processing (which in the menu screens come under the banner ‘CinemaMaster’). Some of the effects, such as ‘Colour Enhancer’ mode, can be used to quickly punch up the colour. BenQ says this is designed to offset fading when watching a video under suboptimal lighting. It works reasonably well but, in our darkened testing room, the resulting picture is a little too oversaturated. Similarly, 'Pixel Enhancer' 4K mode, designed to radically enhance the colour, contrast and sharpness of Full HD video, exaggerates the edges somewhat. However, we’d recommend playing around with the settings. Each living room is different, and what works well for one might not be optimal for another. We start off by playing some 4K Ultra HD Blu-rays, and although the 4K processing might be convoluted, it’s certainly worth its salt. There’s a crispness to the picture that’s immediately enjoyable. In Planet Earth II, the twinkling droplets of water on the stalactites in underground caverns really sparkle, and there’s nice separation between the foreground and background. The fur of a predatory fox is rich with detail - the wisps of fluff on its face are captured well but remain distinct against the white-orange surroundings. However, the lack of HDR is an issue here. The rich turquoises and brilliant greens as the camera pans over idyllic Caribbean islands should blow you away. However, they just aren’t quite fully realised, and some of the magic of Planet Earth II is lost because of it. Changing down to a 1080p Blu-ray of Pacific Rim, the X12000 gives a good deal of texture to the leathery skin of the Kaiju monsters and the craggy wrinkles in its claws as it crashes through San Francisco. The X12000 doesn’t have any motion processing options, so it’s good to see little noticeable judder or jerkiness either when following the smaller, subtler movements or massive battle sequences. It keeps pace with the martial arts training session between Mako Mori (Rinko Kikuchi) and Raleigh Becket (Charlie Hunnam) with ease – whether the focus is on the actors’ muscle tension or their whirling batons. Play an SDR Blu-ray and the X12000 has a rich palette. However, it’s difficult to balance naturally toned faces with sufficient pop to fiery explosions or crashing blue waves - and the X12000 finds it obviously so. There are some other caveats too, and that’s during scenes that mix light and dark elements. When Gypsy Danger – the main robot in Pacific Rim – is being constructed, and its large head is lowered down onto its body, the detail of its metal ‘jaw’ is lost in the blackness. Play a predominantly dark scene from The Conjuring 2 and the X12000 reveals the sweat glistening on Ed Warren’s forehead as he grapples with paranormal forces, but there’s a lack of texture to his wife Lorraine’s hair that means you’re losing out on a fair bit of detail. The X12000 also faces a challenge when you use a standard definition DVD. The material of the hoodie Mark Zuckerberg (Jesse Eisenburg) wears at the beginning of The Social Network looks a little soft and indistinct. But it’s still a watchable picture. When it comes down to it, we find it very difficult to truly recommend this projector. While we can commended it for its sharp picture, natural motion and good handling of SDR content, the lack of HDR means you simply aren’t getting the best out of the source material. The pairing of 4K and HDR is built into every Ultra HD Blu-ray disc, so it’s baffling why BenQ opted to furnish this projector with the former but not the latter. With more movies and TV shows now formatted this way, ultimately this projector isn’t even present-proof, let alone futureproof. If you’re considering paying nearly £10k for a projector, you want the best performance possible. That isn’t going to come from the X12000.